Carols of Christmas and the WWC128 - Heidi's Masculine "Anything Goes" Challenge........ do you think this card works as a masculine card? This week it's Heidi's turn to be hosting and she has opted for one of the of the very popular challenges over at the Watercooler Wednesday Challenge: the Masculine "Anything Goes" Challenge. And as I wanted to play with this brand new set available only to demonstrators in July (and it will be available for customers as a pre-order in August), I decided to create a masculine card , a Christmas masculine card. I used the Card Front Builder thinlits that coordinates with the stamps set, both on the front of the card and inside, sponged some clouds using the clouds mask from the Pattern Party Decorative Masks, die cut trees and a few deers, and stamped the large sentiment inside together with more deers. Inside I stamped one of the large sentiment from the stamps set and for a 'masculine touch' I also stamped the 3 little deers at the bottom. So what do you think? Do you consider this card to be masculine enough for a guy? I think it could even be a winter birthday card, don't you think? 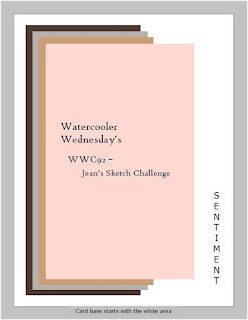 Don't forget to go check the Watercooler Wednesday blog for great ideas and wonderful samples created by the Watercooler Artists, and have a look at the entries so far! WOW so much inspiration for your masculine projects. Thank you for stopping by and please take a few seconds to let me know what you think of my card. 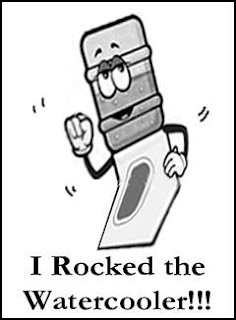 And again thank you to Judy for choosing my card as worthy to rock the watercooler last week for her challenge! That was a wonderful surprise and sure helped to put a smile on my face and make me feel like a 'rockstar'. Update: So proud of displaying this badge! Thank you so much Judy for selecting my card.. I had so much fun with the last Watercooler Wednesday Challenge (and you can see my original entry and my badge! right here) I decided to enter a card for this week too. 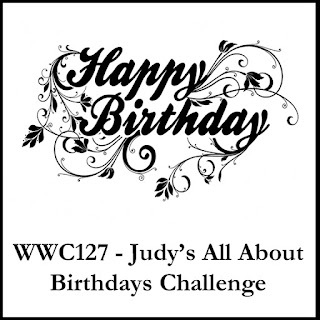 This week it is Judy's turn to host and she wants it "All About Birthdays"
Here is the card I would like to submit for the challenge. It's a fun card that could be for either a boy or a girl. and a little bit of details about the Stampin'Up! products that I have used on this card. 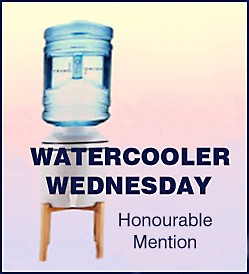 So don't forget to go pay a visit to the Watercooler Wednesday Challenge blog. And if you come and visit, please leave me a comment and let me know what you think of my card and all the fabulous products in that Suite. It has been a long time since I have been able to upload any pictures to my DBWS but it seems, fingers crossed, that a solution has finally been found!!!! For the challenge at the Watercooler Wednesday Challenge this week, Fiona wanted "us to play with some of our "girlie" stuff, especially the bling and the pretty feminine colours. " By the way you must visit their blog and see the new banner!!! So cool. That little girl is so sweet. This card was part of my class and the ladies really loved it. It is a special fold - side step - and while there were some "measurement challenges" with the first class I finally figured out where I went wrong and able to fix the error for the evening class, thanks to the patience of the afternoon ladies! Thank you so much for stopping by and having a peek at my card. So happy that I was finally able to find the reason why I had not been able to upload any photos lately (issues with some automatic updates! grrr....). I was ready to cancel my subscription! Let me know what you think of my card. I always love to read your comments and suggestions. Thanks so much and don't forget to visit the blog and see all the other entries and wonderful work of the Design Team. Masculine card with a Fun & Fancy Fold and Nailed It! Heavy rain today in Cambridge (Ontario, Canada) so this is the perfect day for some stamping and crafting! I created this card last week for a class. It is monochromatic and very CAS. I used the soon-to-be-retired Mint Macaron: cardstock, ink pad, envelope paper. I wanted to show my ladies a different option so for the inside I used another soon-to-be-retired ink, Tip Top Taupe. I hope these colors will eventually come back, sooner than later. There are favorites of mine. Here's my card and the inside, which to keep it really monochromatic, could have been stamped with Mint Macaron. I will be entering this card in the Just Add Ink challenge #353 this week where Karen is asking to "Just Add Critters" . Don't forget to go and visit their blog right here, to see all their wonderful project and all the great entries so far. I may even enter another of my card that has a cute "critter" on it too. Happy stampin' and looking forward to reading what you think of my little dragonfly! Good Day - on this absolutely gorgeous but freezing day! I have a couple of questions for you: Do you make Valentine's Day cards? Or maybe "love-themed" cards that don't necessarily have the "Happy Valentine" sentiment on them? Do you CELEBRATE love? Here's one I made and will be entering in a very special challenge (WWC100) (scroll down to find out more!). It does say LOVE and has a very lovely sentiment inside but it can also be for something else other than Valentine's Day don't you think? It's is hard to see on this photo but all the little hearts at the top having been "painted" with Wink of Stella and so has the larger stamped heart really make this card sparkles. Really pretty IRL. So for this ultra special challenge: can you believe that the Watercooler Wednesday Challenge is celebrating their 100th challenge! WOW I love the Watercooler Wednesday Challenge (even though I have not been participating much lately.....but this is a New Year, right!) and I think that this milestone is more than worth celebrating so I am submitting this Love card to celebrate them. Go check them out. You still have time to enter you very own card for this great challenge. 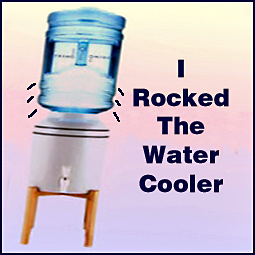 Pay a visit to the Watercooler Wednesday Challenge blog, you won't be sorry! And I would like to also wish a very speedy and complete recovery to Heidi Weaver, coordinator at WWC, who is a bit under the weather right now. All the best Heidi! 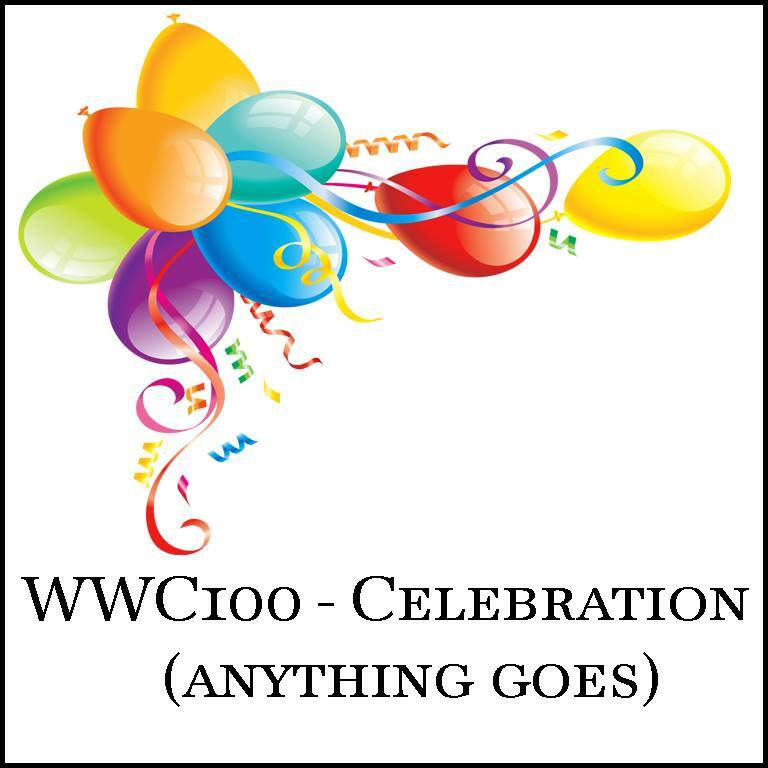 Watercooler Wednesday Challenge blog, Happy 100th and to many many more 100s! 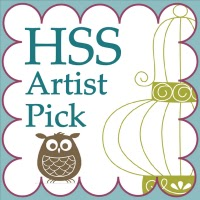 Watercolor Pencils by Stampin’ Up! - Upcoming class in February???? Let me know your thoughts and if you would be interested! Check this video (only 8:19 minutes): just click once below and follow the link to the Stampin'Up! You Tube site. WWC92 - Jean's Sketch Challenge -LET IT SNOW! I made this fun little card based on Jean Fitch's sketch for the challenge at the Watercooler Wednesday Challenge # 92. I started with a Whisper White card base. 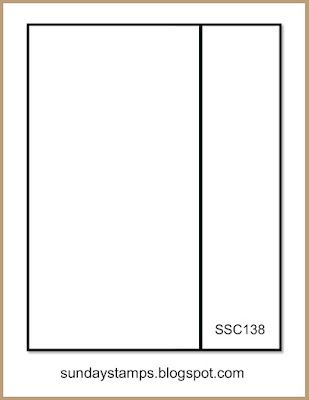 For the various layers or panels I cut 3 pieces from the Warmth & Cheer DSP stack. The top panel has been embossed, after applying Soft Sky ink inside the folder, with the Woodland EF. There are some snow flakes stamped with the Craft Whisper White ink but they are really hard to see. The little snowman peeking through the trees is from the Jar of Cheer. Sentiment and snowflakes are from Snow Place. Hope you will like my card and don't forget to go over to the blog at Watercooler Wednesday Challenge where you will find a lot of inspiration from the Watercooler artists and you still have time to create a card of your own and enter it for the challenge. 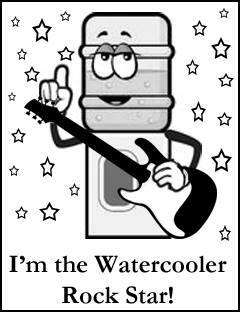 Don't you want to rock the watercooler!!! 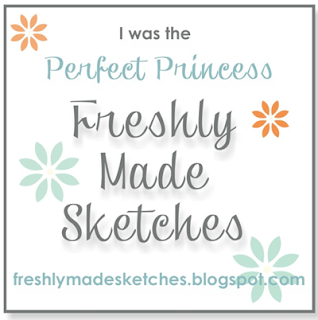 A fairly simply and easy sketch this week at Sunday Stamps. I kept it fairly CAS with a Real Red card base to which I attached a piece of Warmth & Cheer DSP. I then stamped the Father Christmas with Versamark and Black Memento on a Whisper White panel and then heated the Clear embossing powder. He was then colored with Real Red and had some Wink of Stella applied to his beard and fur. It's nicely sparkly IRL but hard to see on the photo. For the other panel I used another piece from the Warmth & Cheer DSP. Sentiment from Teeny Tiny Wishes is stamped on one of the banners from Thoughtful Banners and punched; it is then adhered to the card with dimensionals. I hope you like this card and will let me know what you think. Have a Happy Halloween night! Don't forget to drop by the blog at Sunday Stamps...... you still have plenty of time to create your own and enter it for the challenge.